Yes, this is what a real taco looks like! 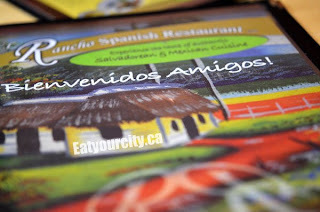 With a craving for savoury cheesey pupasas, authentic tacos and just yummy Elsavadorian and Mexican cuisine, we head back to this quaint and friendly restaurant just off 118 Avenue. Its slower during the weekday, and we didn't require a reservation (weekends they're packed so a reservation is a must as we learned the first time we discovered El Rancho!). The mom and daughter powerhouse team creates all the dishes, so if you don't see anyone up front, be patient (we poked our heads into the kitchen) as they're probably in the kitchen prepping and making something amazing. A small selection (but good quality) of alcoholic, non-alcoholic drinks and freshly squeezed juices were available. We go with what we liked the last time we came: a Salvadoran soda named Cola Champan and one Abuelita hot chocolate. The Cola Champan this time comes in a can instead of a bottle and tastes like a mix between cream soda with a touch of orange pop. Despite knowing the portion sizes are pretty generous, we (again) threw caution to the wind and ordered lots of food, so we could try a large variety of menu items, and so we could have a tasty lunch tomorrow! Most items can be made with chicken, beef, pork or tofu for the vegetables-inclined, and since we tried them last time, we ordered mainly chicken and beef since we liked those the best. We started off with several Mixed pupusas - The freshly made in house fluffy corn tortillas are smoking hot and packed full of chicaron (seasoned pork ground into a smooth pâté) and molten mozzarella cheese. Served with a side of tangy and crisp pickled cabbage salad and homemade tomato sauce rich with pureed fresh tomatoes and a hit of spice that you pile on top of your pupusa... yummmy! Savoury, tangy, spicy and oh sooo good! This was a fest for the eyes and tummy! The tacos were packed with flavor from the seasoned moist shredded chicken, ripped cilantro, spicy sweet diced onions and that ridiculously tasty homemade tomato salsa, all folded up (barely) in a soft fresh flour tortilla. times 4. It was a challenge to hold up the tacos bursting with tasty goodness without having anything spill out. Mmm.. think that wasn't tasty enough? Instead of having the tasty tacos on their own, ordered a side of creamy guacamole rich with ripe avocados and zingy with a punch of lime juice... which we piled on top and dressed it with the addicitively tangy shredded cabbage slaw, and then a spoonful (or three heehee!) of their inhouse salsa made with ripened tomatos... NOM! These tamales brought me back to a street vendor in Mexico City known for their awesome tamales. Banana leaves infuse their unique flavor into the filling of mooshy corn based dough with large chunks of chicken, mashed potato, nutty soft garbanzo beans. Its earthy and reminiscent of Chinese zong (粽子) which is also involves banana leaf wrapped around starches, beans and meat. The tastiness comes from the simplicity of the ingredients, and bringing out the best in them. Just a warning though, these tamales were super filling, so if you're planning on eating more food after, don't eat too many of these! Its served with a side of their tangy cabbage slaw topped with in house salsa. Its great alone, but we stole most of it to use on our tacos heehee! After hearing lots of good things about their fried fish entree from fellow foodies, I'm hankering to try it and we're not disappointed. The picture doesn't do it justice (I'm still very novice when playing around with lighting settings). A fresh whole tilapia fish is dredged in a seasoned flour and fried to perfection. The skin is a delectable crisp with hints of chilis and lime, while the fish is a silky moist tender wow. We had a bit of a surprise - the fish was also stuffed with two large shrimp, both seasoned and surprisingly were not overcooked inside the fish! Paired with fluffy rice laced with a savoury ripened tomato sauce, a generous scoop of seasoned refried beans and El Rancho's mixed salad topped with their secret herb vinaigrette, this was an epic entree that wiped out any chances that we'd have room for dessert. A hidden culinary gem where this family run (and family friendly) restaurant remembers you after one visit, with exemplary service with deliciously simple and complex dishes that would be proud to grace any Mexican or Salvadoran table, without emptying out the piggy bank. Just make sure you call ahead for reservations as they're busy (sometimes they take holidays and close up for a week or two for quality family time). So go, eat, and you won't be disappointed! La comida estuvo deliciosa! Next time, must save room for their fried ice cream or tres leche!! 1) Did you notice their taco only has one tortilla? :) Some people might complain about that fact but, as I learned, there is no written rule about it. 2) The slaw is called "curtido" (or, in some places, "encurtido"). It means pickled. They are usually served along with the pupusas. The poeple that work at El Rancho are great! We booked a birthday party that fell on Boxing day. They opened special for us, made us feel welcome, served us great food. What more could you ask for! Try the cake it is amazing. We always try, but we almost always run out of room for dessert! Been there numerous times, but sitll haven't had a chance to try thier tres leche yet!